This year it was my plan to do challenges a little differently. There have been some challenges over the years that I have participated in that I thoroughly enjoyed doing, but that weren't really .... challenging. For example, the 100+ Reading Challenge - I liked joining up for it, but it meant maintaining a blog post showing all my reads even though I knew that I would get past 100 books easily. Another example is that Pub10 Challenge - to read 10 books that were published in 2010. Thoroughly enjoyed it, but it would have been a very nasty shock to me if I didn't finish it with months to spare. So this year I decided that I was going to do challenges that were challenging. The only problem I have just realised that I have only signed up for five challenges so far which doesn't seem like a lot, even to me. Having said that, I am hoping to actually do some reading for my perpetual challenges this year as well, because they have been sadly neglected over the last couple of years. Objective: Read and review books written by Australian Authors - physical books, ebooks and audiobooks, fiction and non-fiction! Challenge Levels: TOURIST or TRUE BLUE! The book titles are just suggestions, you can read whatever book you want to fit the category. Books may be any form (audio, print, e-book). Books may not overlap categories; you need a different book for each category. Creativity for matching the categories is not only allowed but encouraged. You do not have to make a list of books before hand. You do not have to read through the categories in any particular order. This was one of my favourite challenges from a couple of years ago, but I didn't participate last year. This year the theme is US Civil War, and I am back in again! I am just Dipping my toes into the challenge this year. This year you have options when reading your fiction, nonfiction, graphic novels, etc. with the U.S. Civil War as the primary or secondary theme. Books can take place before, during, or after the war. Books from other challenges count so long as they meet the above criteria. Dip: Read 3-5 books in any genre with the U.S. Civil War as a primary or secondary theme. Even though I didn't manage to successfully complete this challenge last year, I am back for it again this year! 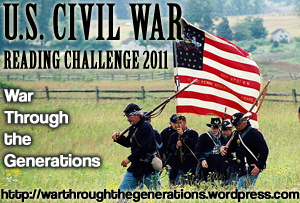 ~ The challenge runs from January 1, 2011 to November 30, 2011. ~ Any books read for this challenge can also apply to other challenges you are working on. ~ Any book written by an Irish author, set in Ireland, or involving Irish history or Irish characters, counts for the challenge – fiction, non-fiction, poetry, audiobooks, children’s books – all of these apply. ~ Write up a post indicating that you are participating (feel free to copy the lovely graphic at the top of this post), and then add your challenge post’s link to the Mr. Linky on the main challenge page. 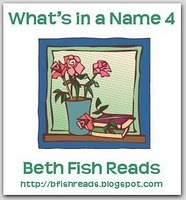 ~ You don’t have to list your books ahead of time – just have fun reading throughout the year. ~ I will put up a page for the challenge in my left sidebar, and add a Mr. Linky for reviews and wrap-up posts. ~ Everyone who fulfills their challenge level and writes at least one review is eligible for the giveaway prize at the end of the challenge: a copy of Tipperary by Frank Delaney. Wrap-up post and giveaway details will go up at the beginning of December, which is why the challenge ends on November 30th. ~ Thanks to Serena, who had a wonderful idea, we will be adding a new element this year. 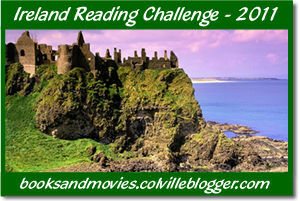 In the month of March, in honor of St. Patrick’s Day, we will do a read-along for any challenge participants or other bloggers who are interested. I have no idea which book we should read for the read-along, though, so please leave your suggestions in the comments. I will compile a list and post a poll in which you can vote for your pick. Yay!!! I'm so happy you added WIAN4 to your challenge list. I hope you find it fun. I'm in some of the others too. These challenges sound really good! I need to have a think about which ones I should join. Historical fiction is very tempting though, especially as I've just started Fall of Giants by Ken Follett (huge chunkster). Thanks for posting some great choices! Sounds like you have picked some challenging ones! I love What's In a Name--hope you enjoy it. 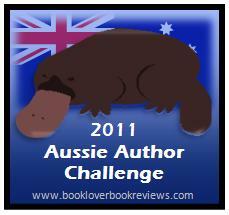 A very warm welcome back to the second year of the Aussie Author Challenge Marg! Looking forward to hearing what you think of Gunshot Road. I was going to join in with the Aussie one this year myself, but I think I've bitten off more then I can chew. That's cool you're doing What's In A Name! I started asking if you knew what you were going to read yet on my blog, but thought I'd come over here. Do you have an idea yet? I'm set except I'm still trying to figure out one that includes a gem or jewellery. It looks like a pretty good challenge. Good luck on your challenges! The challenges I've signed up for this year are almost all (except for two that require me to get some books not already on my shelves, like the Get Steampunked Challenge) to get my personal TBR piles down to a somewhat manageable level. My personal challenge (and I've already found myself tempted to fall of the wagon here) is to not purchase one new or swapped book until I've finished two in my pile!